Families and groups of up to 10 people who want to relax in a private luxury home. Relaxing in a private property while being surrounded by nature and comfort is possible at Virador Villa. 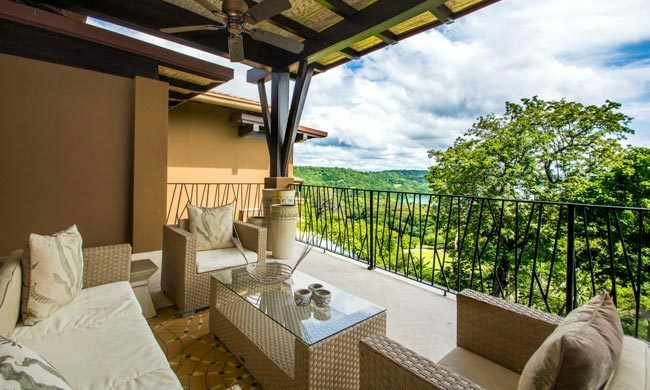 With three bedrooms and a strategic location, Virador Villa in Guanacaste is a great location to unwind and forget your worries while enjoying ocean views, resort amenities, and wildlife. Secluded environment. Privacy and comfort abound in this property. Well-appointed spaces. Top-of-the-line amenities feature on every room. Expansive views. Observe the ocean and surrounding dry forest from your windows and balconies. Off-the-grid experience. The villa is in a community where you can access shared spaces. City life. This is a place to commune with nature, although resort amenities are close by. Located in a gated and private community, this gem is named after one of the beaches in the area. The Papagayo Peninsula is the beautiful backdrop to your stay, boasting ocean views and vegetation. Perched high above the signature Arnold Palmer Signature golf course, Virador Villa is a spacious home with a secluded atmosphere close to beaches and adventure activities, ideal for those in search of rest. With world-class designs and earth colors, Virador Villa has been appointed with state-of-the-art appliances and furnishings that make it a comfortable, beautiful stay in one of the most luxurious areas of Guanacaste. The home was built to merge with its surroundings, and windows and balconies all open up to the treetops from the nearby dry forest. Here wildlife abounds. In a quiet morning keep an eye out to try and spot all the birds and monkeys that sing and walk among the branches. In the meantime, there are plenty of views to admire, embracing Virador Villa with their full colors. Culebra Bay and the marina are just some of the locations to see from the comfort of your chair. All rooms are well-appointed and decorated with soft colors that bring up the natural elements around the property. This creates a peaceful atmosphere with elegant wood finishings. Staying at Virador Villa allows you to use the community’s shared swimming pools with ocean views. Lounge at the sunbeds and enjoy the surroundings with a cocktail in hand. The home is also strategically located near adventure tours, like horseback riding and zip lining, as well as activities to commune with nature, such as scuba diving, snorkeling, and hiking. The close-by marina is the point of departure for those who want to go sportfishing as well. Enjoy access to the amenities and facilities from the resorts at the peninsula. The Arnold Palmer Signature golf course is all yours to enjoy, as are the many gourmet restaurants that provide a unique culinary experience every day. Luxurious and calm, Virador Villa is a great option if you want to stay in the Papagayo area and enjoy a private home while still having access to resort amenities. Contact us and we’ll gladly help clear any questions so you can start planning your Costa Rica vacation today! Marina and several restaurants located nearby. Balcony with built-in BBQ and dining space. Expansive views of the Pacific ocean and forest.